FILE - This aerial photo taken through a glass window of a military plane shows China's alleged on-going reclamation of Mischief Reef in the Spratly Islands in the South China Sea, May 11, 2015. China's actions in the South China Sea have led to "self isolation," galvanizing regional neighbors to turn against Beijing, according to U.S. Defense Secretary Ash Carter. Carter told lawmakers on the House Appropriations Committee on Thursday that China's "dredging and putting military equipment" on disputed islands in the South China Sea have caused both old U.S. allies, such as Japan and the Philippines, and new allies, such as Vietnam and India, to work increasingly with the United States. "The reason that these activities are getting notice isn't because the United States is doing something new," Carter said. "We've been sailing in the South China Sea and will continue to sail wherever international law allows." China claims the majority of the South China Sea as its own, and its territorial claims overlap with those of Taiwan, Vietnam, the Philippines, Malaysia and Brunei. 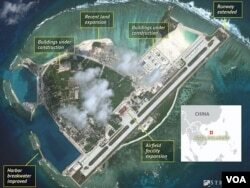 In recent years, China has embarked on an ambitious project to construct artificial islands in the remote sea that are capable of supporting an airstrip and housing military equipment. Admiral Harry Harris, the commander of the U.S. Pacific Command, told reporters at the Pentagon on Thursday that China has reclaimed nearly "3,000 acres of military bases" in the South China Sea. Last week, satellite photography company ImageSat International (ISI) published an image showing advanced surface-to-air missiles on the disputed Woody Island in the South China Sea. A U.S. official confirmed the missile deployment to VOA and said the Pentagon was "concerned." Harris said he believes China is "militarizing" the South China Sea and changing the military's "operational landscape." He added that the U.S. will continue "freedom of navigation operations" — missions that fly over or patrol through areas that China claims as its own but that international law claims is free for the international community. "I believe that we need to do them and we need to do them on a regular basis," Harris said. With only two freedom of navigation operations completed, Harris said it was "too soon to tell" if they were having an effect on China's behavior. China has called these patrols and flyovers provocative.